Collectively, the bedtools utilities are a swiss-army knife of tools for a wide-range of genomics analysis tasks. The most widely-used tools enable genome arithmetic: that is, set theory on the genome. For example, bedtools allows one to intersect, merge, count, complement, and shuffle genomic intervals from multiple files in widely-used genomic file formats such as BAM, BED, GFF/GTF, VCF. While each individual tool is designed to do a relatively simple task (e.g., intersect two interval files), quite sophisticated analyses can be conducted by combining multiple bedtools operations on the UNIX command line. 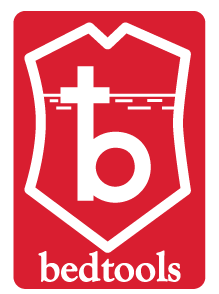 bedtools is developed in the Quinlan laboratory at the University of Utah and benefits from fantastic contributions made by scientists worldwide. We have developed a fairly comprehensive tutorial that demonstrates both the basics, as well as some more advanced examples of how bedtools can help you in your research. Please have a look. As of version 2.28.0, bedtools now supports the CRAM format via the use of htslib. Specify the reference genome associated with your CRAM file via the CRAM_REFERENCE environment variable. Bedtools will look for this environment variable when it needs to access sequence data from the CRAM file (e.g., bamtofastq ). With the exception of BAM files, bedtools assumes all input files are TAB delimited. bedtools also assumes that all input files use UNIX line endings. When using the -sorted option with files whose chromosomes are not lexicographically sorted (e.g., sort -k1,1 -k2,2n for BED files), one must provide a genome file ( -g ) defining the expected chromosome order. bedtools requires that chromosome naming schemes are identical in files that you are comparing (e.g., ‘chr1’ in one file and ‘1’ in another won’t work). .fai files may be used as genome ( -g ) files. In addition, here are a few examples of how bedtools has been used for genome research. If you have interesting examples, please send them our way and we will add them to the list. Coverage analysis for targeted DNA capture. Thanks to Stephen Turner. RNA-seq coverage analysis. Thanks to Erik Minikel. Identifying targeted regions that lack coverage. Thanks to Brent Pedersen. Calculating GC content for CCDS exons. Making a master table of ChromHMM tracks for multiple cell types. As of version 2.18, bedtools is substantially more scalable thanks to improvements we have made in the algorithm used to process datasets that are pre-sorted by chromosome and start position. As you can see in the plots below, the speed and memory consumption scale nicely with sorted data as compared to the poor scaling for unsorted data. The current version of bedtools intersect is as fast as (or slightly faster) than the bedops package’s bedmap which uses a similar algorithm for sorted data. The plots below represent counting the number of intersecting alignments from exome capture BAM files against CCDS exons. The alignments have been converted to BED to facilitate comparisons to bedops. 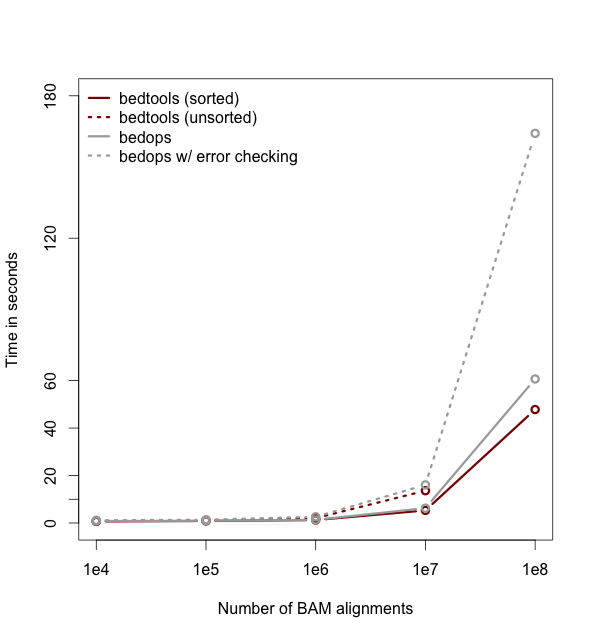 We compare to the bedmap --ec option because similar error checking is enforced by bedtools. Note: bedtools could not complete when using 100 million alignments and the R-Tree algorithm used for unsorted data owing to a lack of memory. Let’s imagine you have a BED file of ChiP-seq peaks from two different experiments. You want to identify peaks that were observed in both experiments (requiring 50% reciprocal overlap) and for those peaks, you want to find to find the closest, non-overlapping gene. Such an analysis could be conducted with two, relatively simple bedtools commands. # intersect the peaks from both experiments. # peaks from each experiment. bedtools is freely available under a GNU Public License (Version 2). Bedtools is a fast, flexible toolset for genome arithmetic. © Copyright 2009 - 2017, Aaron R. Quinlan and Neil Kindlon. Last updated on Mar 23, 2019.